I know you guys are always excited about some tricky storage hacks because all of us don’t dwell in ultra luxurious grand houses right? 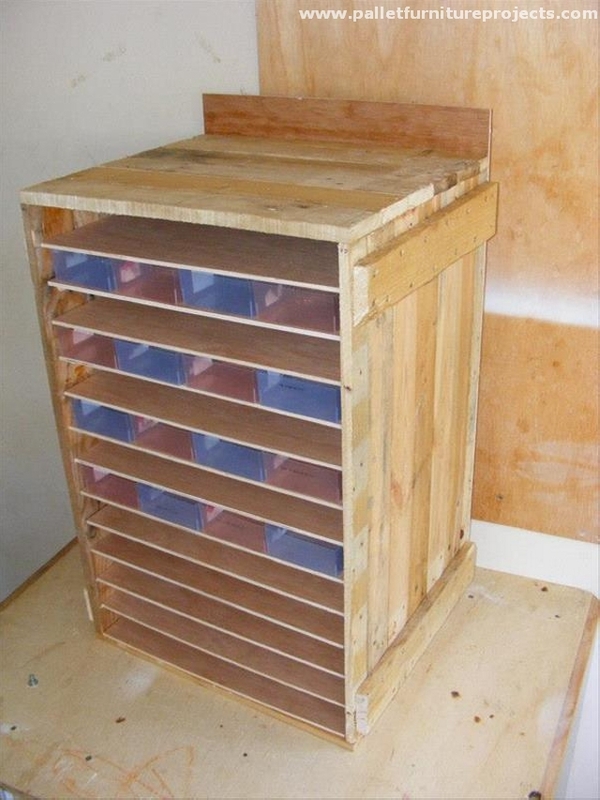 And the land has already been so damn expensive here in west, so having some storage hack idea is always a source of instant relief for all such dwellers who reside in the houses with square feet measurements. 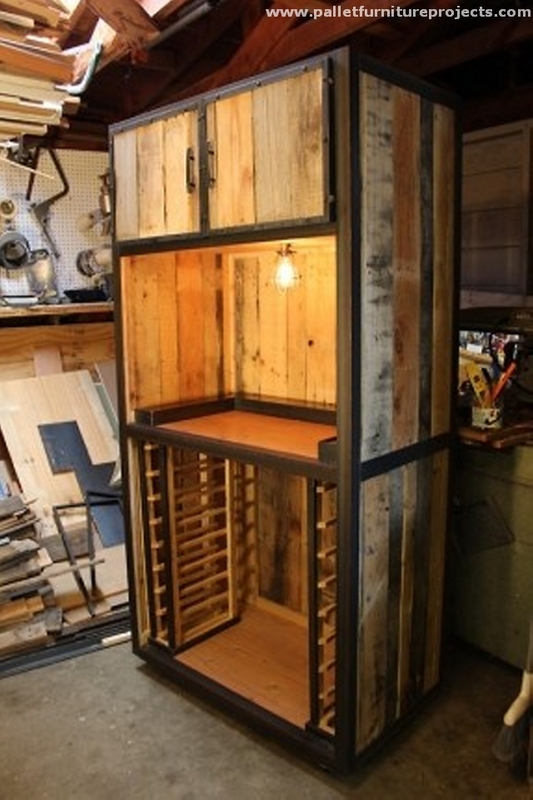 What could be the best thing for the storage? 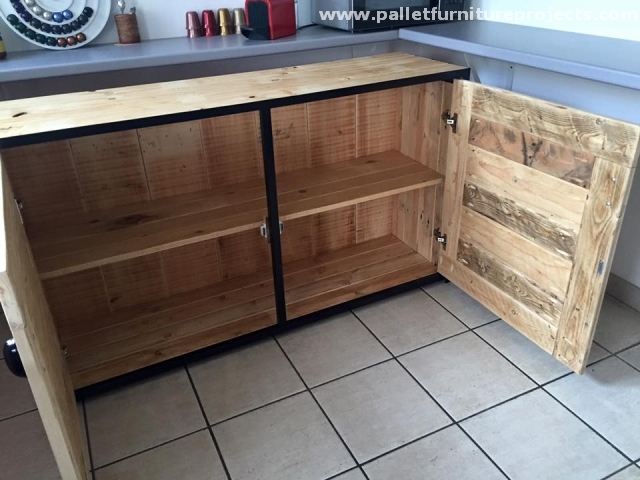 I am sure that it has to be a wooden cabinet where you can stuff in all kind of accessories and the wooden items also look great inside the room because wood has got its own impact. 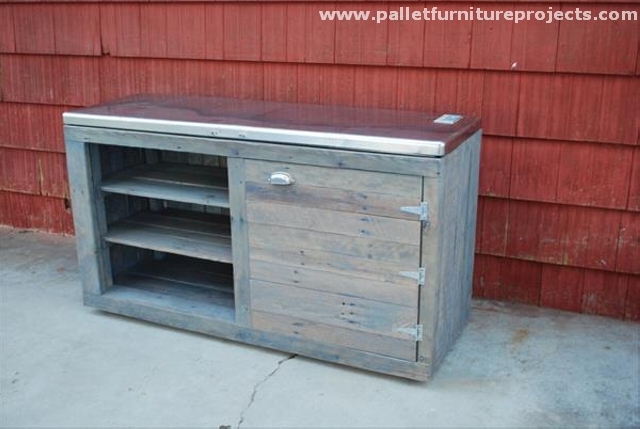 Showing my deepest concerns over you lust for the storage cabinets, I am bringing you this gigantic wood pallet recycled storage cabinet idea. 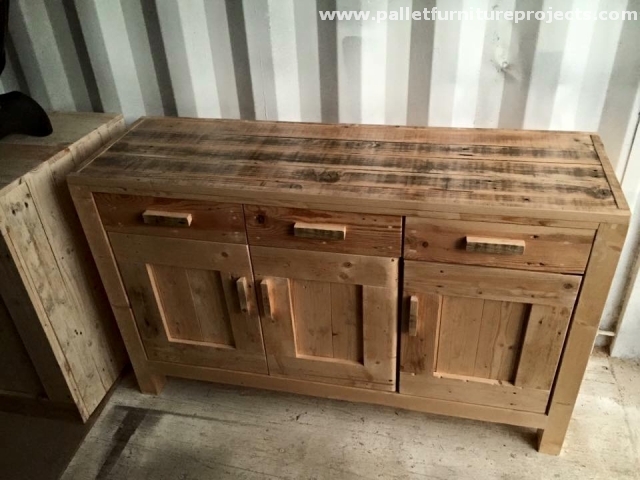 So you just don’t need to be worried about the storage space anymore because this has got it all, long and tall frame with drawers and cabins, stuff it with your accessories and enjoy the space freedom. 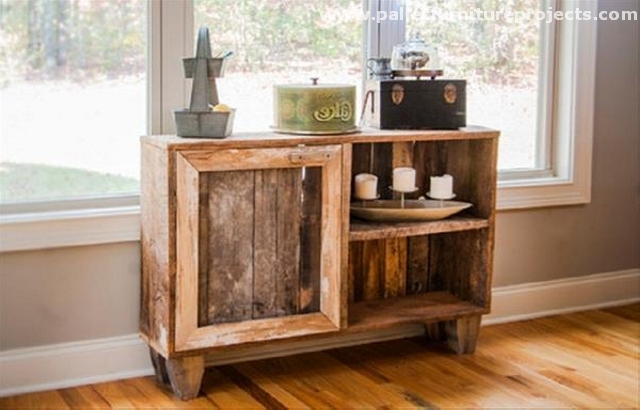 Wow, what about this vintage wooden pallet repurposed storage cabinet? 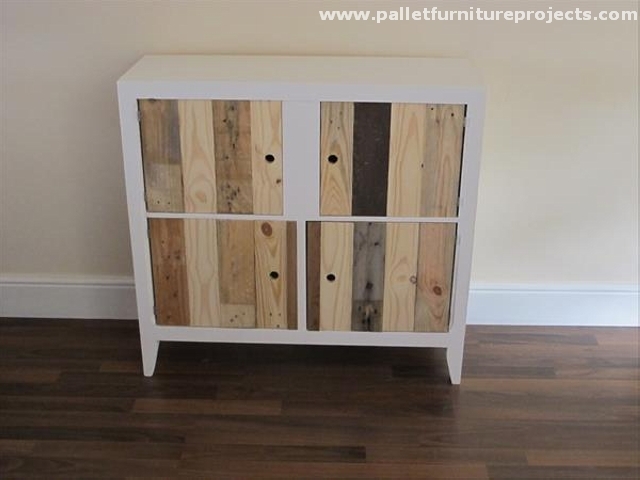 This would look pretty great in some lounge having an extra large size, this could get a bit too bigger for your room. 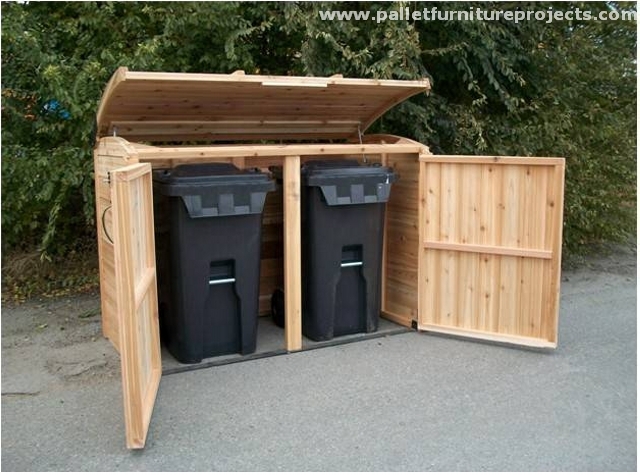 Want to take care of your trash bins? No problem at all. 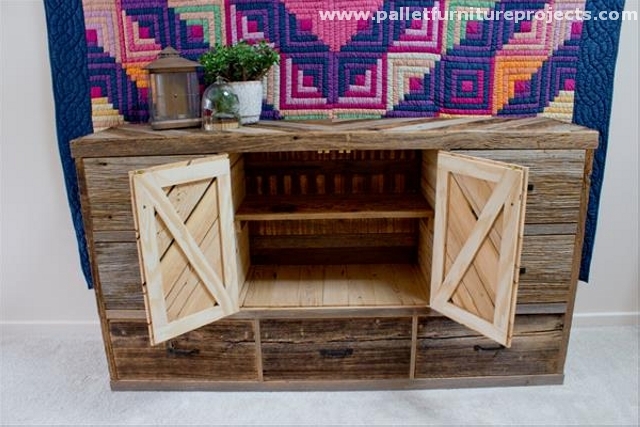 Recycle this wooden pallet cabin using the same shipping pallets and you old techniques as a carpenter and you would be amazed the way even your trash bins are treated. Close the doors once you have used the trash bins. 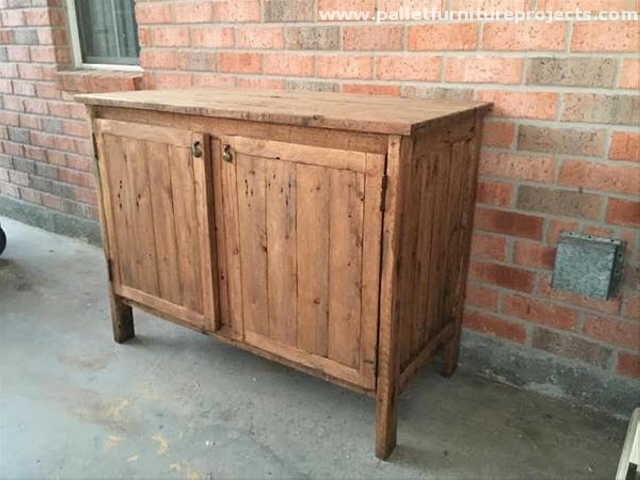 This is something quite conventional, something much similar to the conventional dressing tables. 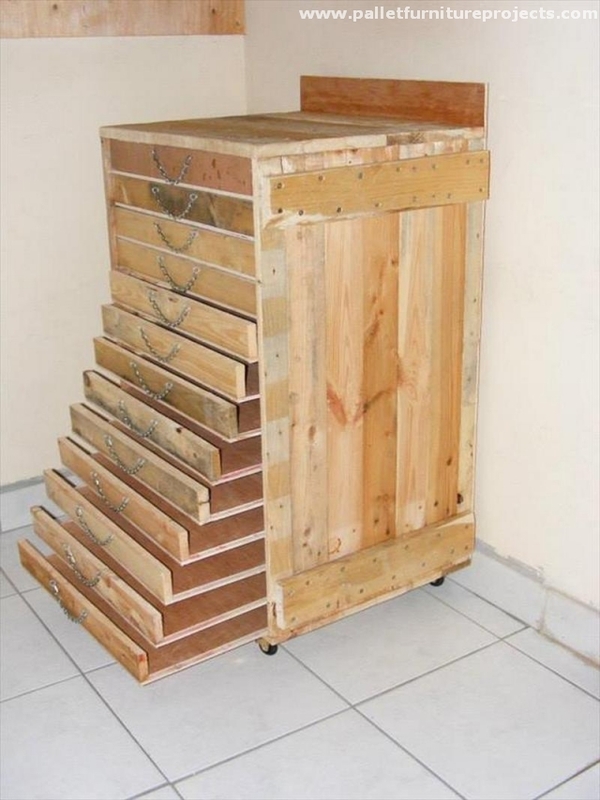 But if you go out there in market to buy such an item, your wallet would be drained out so better stay away from the shocks and try recycling this wooden pallet storage cabinet for your domestic use. Here we intended to keep it as simple as possible, ad so we did. 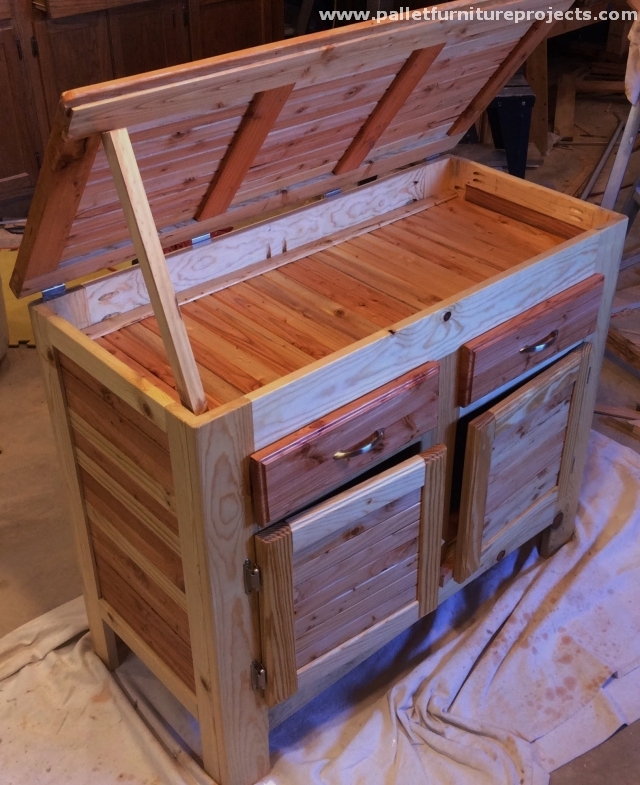 We just built a grand trunk with some built in doors, and we divided the internal space in two pieces separated with a plan wooden slab. 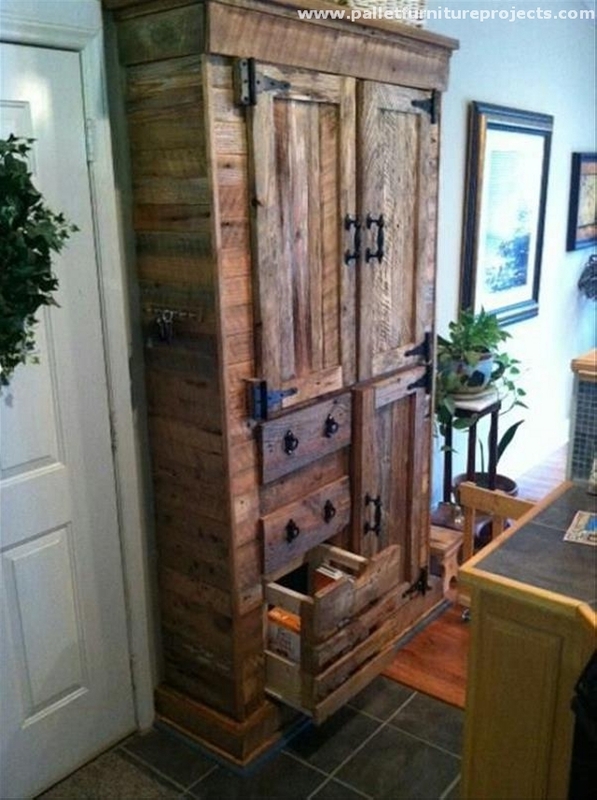 I think this is pretty enough for your daily domestic storage affairs. 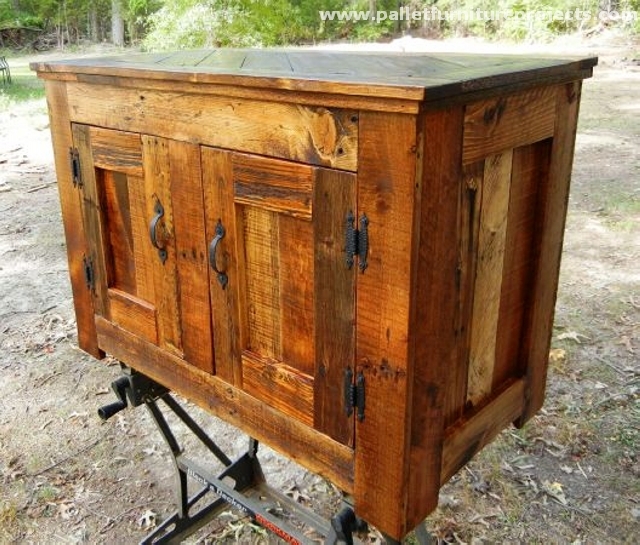 Now this is a vintage storage cabinet that we used to see at granny’s house in good old days. Though the design is pretty classic and superb, it has also got a pretty smooth top which can also be used as an outdoor table. 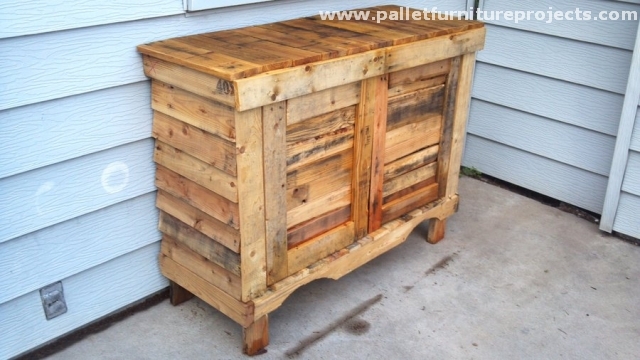 Even if you have got some deteriorated and broken pallets, no worries at all. 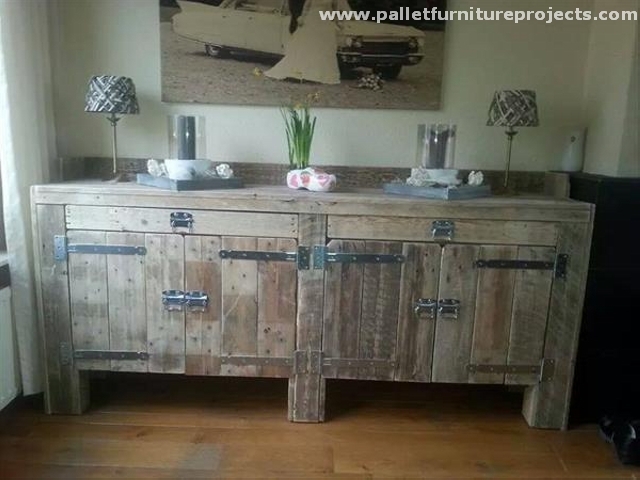 You just have to make it look fabulous using your skills and techniques that you have got polished in the course of wooden pallet recycling. It is provided with all necessary cabins and drawers which is a huge sigh of relief for the dwellers of small houses. And last one is partially closed and partially open with half covered frontal door. 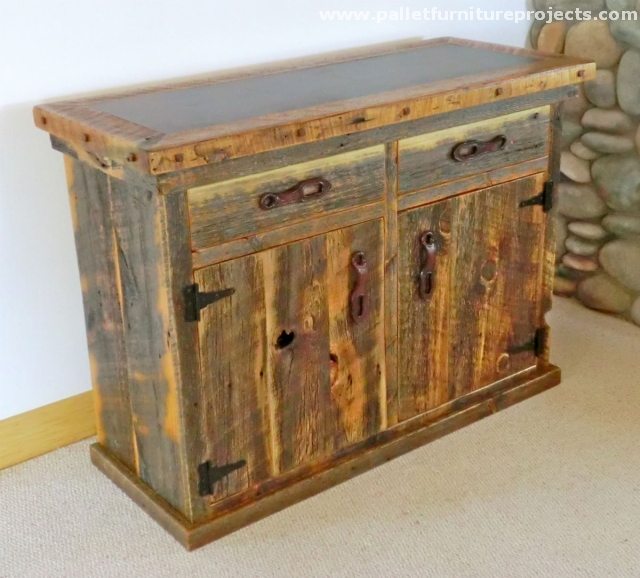 It has again got its storage space divided with the same wooden pallet slab, and can also be used as decent wooden table inside the lounge.